Learn how to enable cookies in Firefox, Chrome, Internet Explorer (IE), Safari, Opera and Android browsers. Enabling cookies might help resolve login problems on websites. If you’re facing login problems, it is likely that you may need to enable cookies in your web browser (e.g. Firefox, Chrome, Internet Explorer, Safari, Opera etc.). While doing login, you may want to use options like Remember me so that the browser automatically logs you in when you visit the website next time. Browsers remember your login information by creating a cookie in your computer. But if you haven’t enabled cookies in your browser settings, these options will not work. 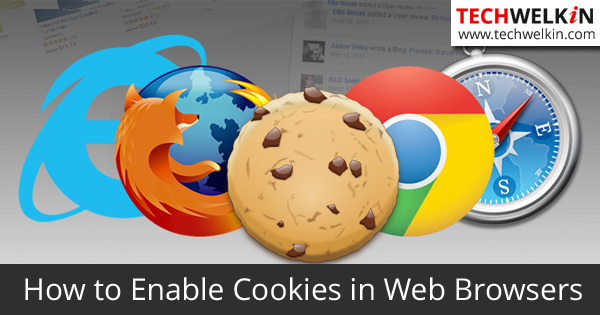 In this article, we will see how to enable cookies in various web browsers. Cookies are small text files that are created by websites you visit. These websites store session information in cookies. When you visit next time cookies are “read” by websites to help recreating a new session for you. Enable cookies in your browser to avoid login problems. I personally love Firefox! It’s a great browser (especially for web developers). There is neck-to-neck competition between Firefox and Google Chrome in terms of popularity. Tick the checkbox next to Accept cookies from sites to enable cookies. The best thing about Google Chrome is that it is lightning fast. I also like it’s neater interface as compared with Firefox. Oh well! Internet Explorer has faced a lot of criticism because it does not follow standards and Microsoft is really lagging behind in making Internet Explorer a better browser. Nevertheless, a lot of people around the world use IE because it comes bundled with Windows operating system. This was all about how you can enable cookies in popular browsers like Mozilla Firefox, Google Chrome, Internet Explorer, Opera, Safari and Android. If you have been facing login problems with a website, enabling cookies might prove to be the required solution. If you have any question regarding this topic, please feel free to make a comment and ask. We will try our best to assist you. Thank you for using TechWelkin! I switched my modem to the bridge mode and after that when I’m trying to connect to the modem through default address 192.168.0.1, I’m getting a message ERR_TOO_MANY_REDIRECTS. Other web pages open with no problem.